Barcelos has used ingredients like tomato powder and chili flakes in the red burger and its veg burger patty is potato free. Beetroot and chickpeas are the ingredients which have been used to make veg patty. 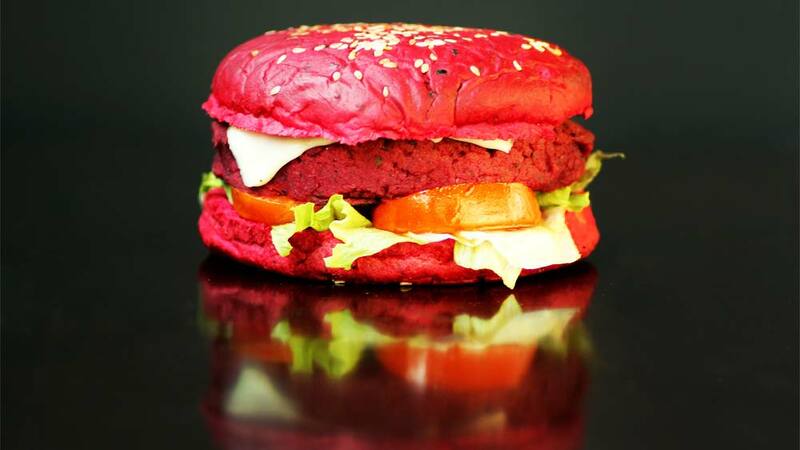 After introducing the dramatic Black Burger in India, now it’s time to turn for red as Barcelos introduced the messy burger in town. The casual dining chain which has caught the gourmet’s imagination with the inception of black burger in India is already getting rave reviews from its restaurant at Khan Market in Central Delhi. “After black burger, we wanted to bring more excitement for our customers especially for the burger lovers. So this time we thought to treat the foodies with our messy red burgers. These burgers are very healthy as we always keep the nutritional value in consideration. Hence we have not used any artificial color to it. It’s all organic ingredients which we have used in it,” shared Rohit Malhotra, GM Operations, Barcelos India. Barcelos which is famous for its flame grilled menu and later for the black burger’s magic now goes one more step ahead and launches its messy red burger in three variants i.e. Bloody Red (veg) priced at Rs 175, Red Hotie (chicken) priced at Rs 215 and Red Meaty (mutton) priced at Rs 295. These messy burgers are complete red burger with the red patty in it which will draw people’s attraction and tempt them to try it out. After Maggi, Top Ramen withdrawn from market..